PARIS - On Saturday and Sunday, Romania's President Klaus Iohannis will participate in events commemorating the centennial of WWI's armistice. The Romanian head of state, invited by the French President Emmanuel Macron, will attend the centennial ceremony at the Triumphal Arch alongside leaders of the belligerent countries in WWI and also leaders of the states that supported the war efforts. Also, Klaus Iohannis will attend the inaugural edition of the Paris Peace Forum, president Macron's initiative, focused on supporting and striving to improve global governance in the fields of peace and security, environment, development, technological advancement and economy. In Paris, president Iohannis will also meet with Romanian research students. According to the Romanian Presidential Administration, the meeting organized at the Romanian Embassy in Paris is devoted to Romanian contributions to the development of science and technology, in the Centenary Year of the Great Union.  COLECTIV - The first 25 witnesses have been subpoenaed to testify today, at the Bucharest Tribunal, in relation to the fire that broke out three years ago at the Colectiv Club in Bucharest. We recall that on October 30th, 2015, during a rock concert, a fireworks show started a fire, which killed 64 people and wounded another 200. The owners of the club and the former district mayor Cristian Popescu-Piedone are being tried in relation to this case. The owners are accused of encouraging and allowing the access of people beyond the club's admitted limit, especially given that the facility did not have enough emergency exits. Also, they allowed the fireworks show, although the club's interior arrangements were unfit for such activity. On Thursday, survivors of the fire talked with the health minister Sorina Pintea about implementing in Romania a rapid intervention mechanism in case of accidents that cause third-degree burns. TRADE DEFICIT - According to the National Institute of Statistics, Romania's trade deficit grew by more than one billion Euros in the first nine months of the year. Thus, the deficit of the trade balance, which is the difference between the value of imports and that of exports, has reached 10 billion Euros. This year, a big share of both imports and exports has been held by transport machinery and equipment. VISIT - The Romanian and Canadian Defense Ministers, Mihai Fifor and Harjit Singh Sajjan respectively, are paying a visit to the Mihail Kogalniceanu air-base in south-eastern Romania. The two officials will meet with soldiers from the Canadian detachment deployed in Romania for enhanced air-policing missions, as well as with Romanian Air Force staff. A communiqué issued by the Romanian Defense Ministry reads that the Canadian detachment, made up of 135 soldiers and CF-188 Hornet fighters, are carrying out, alongside MiG-21 LanceR aircraft and Romanian Air Force soldiers, enhanced air policing missions under NATO command. According to the same communiqué, jointly deployed Air Policing missions contribute to the development of reaction and deterrence capacity, as well as to the enhancement of interoperability between the Romanian Air Force and the Canadian Royal Air Force. SANCTIONS - The US has announced new sanctions against individuals and entities in relation to the annexation of Crimea and the violation of human rights in the Ukrainian regions controlled by Russia, France Presse reports. Financial sanctions are aimed at preventing such individuals and entities from doing business with Americans and banning them access to the US market. The Washington Administration stated in July it did not recognize the annexation of Crimea by the Russian Federation. HANDBALL - Romania's women's handball champions CSM Bucharest on Sunday plays away from home against FTC-Rail Cargo Hungary, in Champions League's Group D. The Hungarian team ranks first, with 6 points, followed by CSM Bucharest with 4, and Kristiansand of Norway and Bietigheim of Germany with 3 points each. The first three highest ranking teams will qualify for the main groups. On Thursday, in the men's competition, the current holder of the national title, Dinamo Bucharest, defeated Ademar Leon of Spain on home turf. Dinamo gained 10 points and now tops the group rankings. The main counter-candidates for play-offs qualification are Ademar Leon, which currently has 9 points, Wisla Plock of Poland and Elverum of Norway, with 8 points each.